Our delicious gluten, wheat and milk free white rolls are delightfully flavoursome, and are a source of dietary fibre. With superb flavour and a wonderful texture, our gluten free rolls are a great choice for your favourite sandwiches, and are perfect for burgers. Water, Tapioca Starch, Potato Starch, Maize Starch, Rapeseed Oil, Yeast, Egg White Powder, Stabiliser: E464; Sugar, Vegetable Fibre (Psyllium), Calcium Carbonate, Fruit Extract (Carob and Apple), Salt, Humectant: Vegetable Glycerine; Rice Flour, Preservative: Calcium Propionate; Natural Flavouring, Iron. Our gluten, wheat and milk free multiseed rolls are delightfully flavoursome. Roast Pork and Apple is a partnership made in heaven. 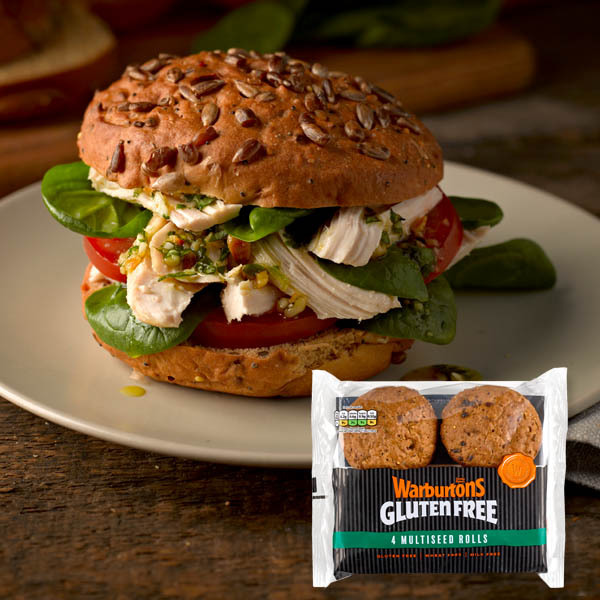 Put the two together in our Warburtons Gluten Free White Roll and you have a delicious midweek supper.